Audrey and best mate, Mitsi, hosted the end of year break-up. The Fraser Coast Branch of the Wildlife Preservation Society of Queensland has a very long and credible history in protection of local wildlife. 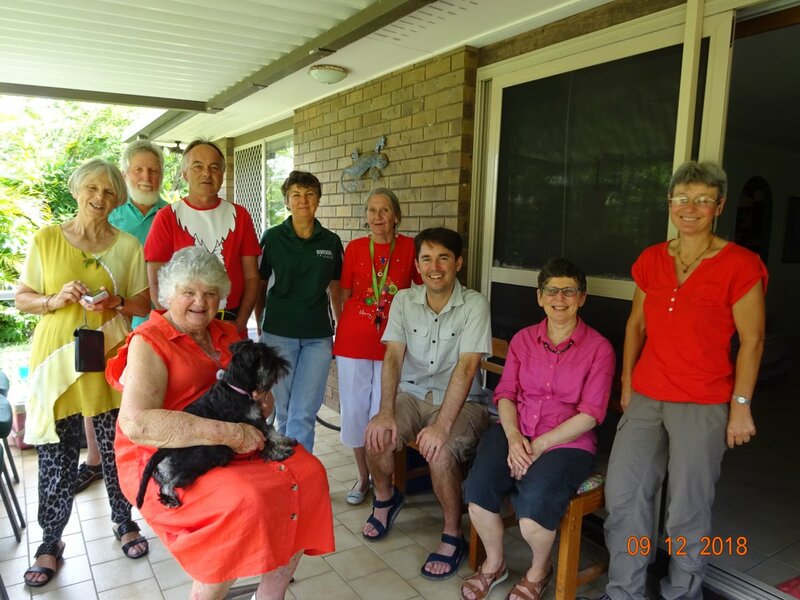 The Branch engages members and the local community through a consistent and well organised range of activities including monthly Nature Walks, monthly Library Talks, and workshops as they arise. By invitation, we have representation on the Environmental Advisory Group (EAG) with Fraser Coast Regional Council. Issues addressed through the bi-monthly meetings of the EAG include: disturbance of feeding/roosting migratory birds; input into development/revision of a Threatened Species Action Plan; preparation of signage re. protection of turtles; identification of portions of land to be purchased with funding from the past Environmental Levy; and any other issues that are raised by the range of representations on the EAG. Through an agreement with the University of the Sunshine Coast, the Branch is sponsoring a university Prize which is awarded each year to the highest performing Fraser Coast student in ANM102 Endangered Animals and their Conservation. The first of these has been awarded for 2018, with two more to follow. Other Branch activities include production and publication of a quarterly A5 sized 24 -page newsletter that has been going for an amazing 50 years. Another publication outlet is our monthly Wildlife Matters column in the local Independent newspaper. Our Facebook page (Wildlife Qld Fraser Coast) is an active source of information and exchange of thoughts. And, of course, the webpage that you are reading this from. All these activities go towards encouraging Branch members and the community to understand and appreciate the wildlife and natural places of the Fraser Coast. Find us on Facebook @WPSQFraserCoast. Meetings Monthly. Usually in Hervey Bay, but occasionally at other locations in the region.